As it is getting dark at 4.00 in the afternoon the hours of daylight are starting to run out. 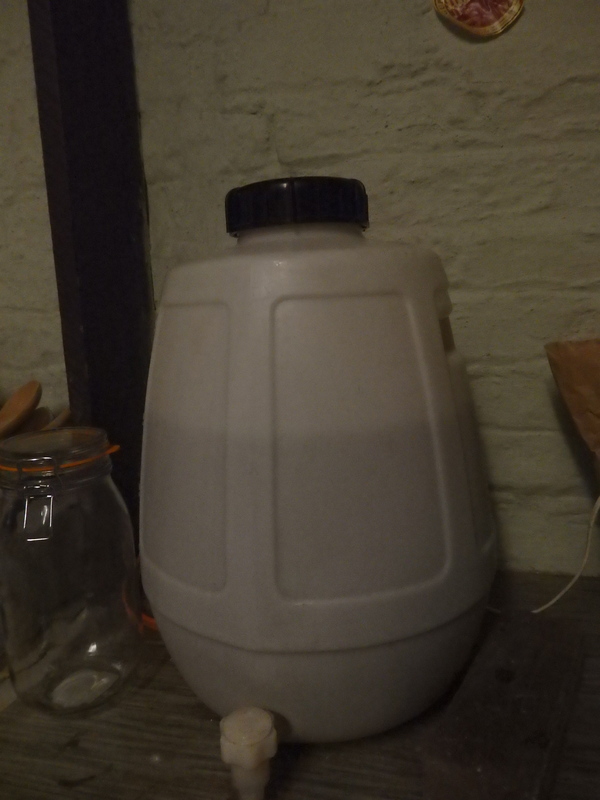 And then, after the sun has gone down, there is not a great deal to do but stare at the barrel of beer which should be ready for testing this time next week. All I can remember about the last beer that I made was that it felt slightly hallucinogenic. Lets hope this batch works as well. The eldest boy thinks we should be challenging ourselves to get it all drunk by Christmas. i am not sure how much of a good idea that is. We shall see next week when the barrel gets cracked. In the meantime the rib of beef has been gently rubbed with olive oil and seasoned with salt and pepper. It has just spent 15 minutes in a very hot oven. This has now been turned down and the kitchen is filling with the good smell of cooking beef. Some of the horseradish has been grubbed from the garden. The two thickest roots were cleaned and peeled and grated. There was a blinding moment when I took a sniff at the freshly grated root and the back of my nose came off. All of which bodes well for the eating of it all in 40 minutes or so time. And I have just had a taste. And it is very good indeed, A spinach and ricotta tart has been cooked as well.